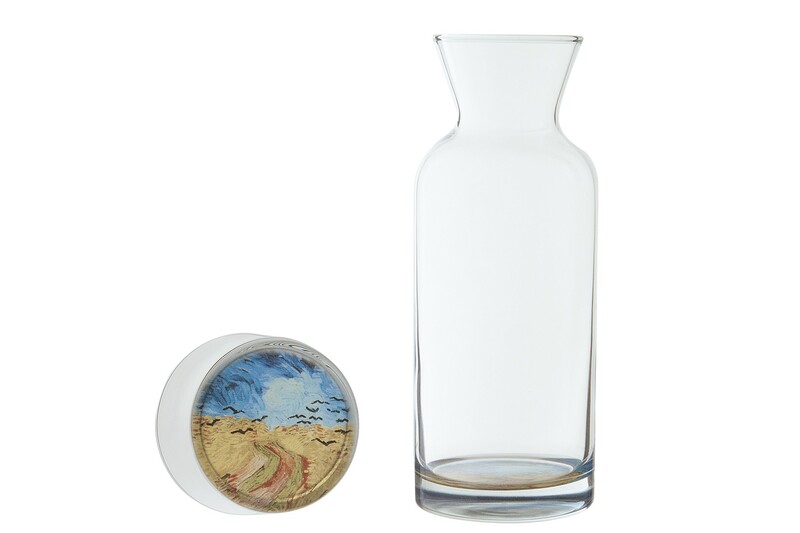 Glass carafe and cup with a surprise at the base: one of the masterpieces by Vincent van Gogh: The bedroom in Arles or Wheatfield with Crows. Charming and useful on a nightstand in the bedroom or guest room. 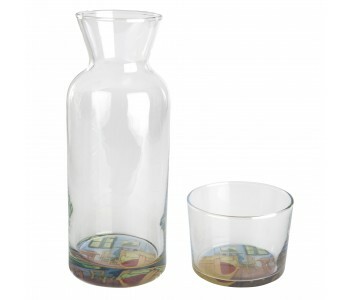 What distinguishes the Van Gogh carafe and accompanying cup is what's on the bottom: one of the masterpieces by Vincent van Gogh. You can choose between the painting of his own bedroom in his house in Arles, or wheatfield with crows. 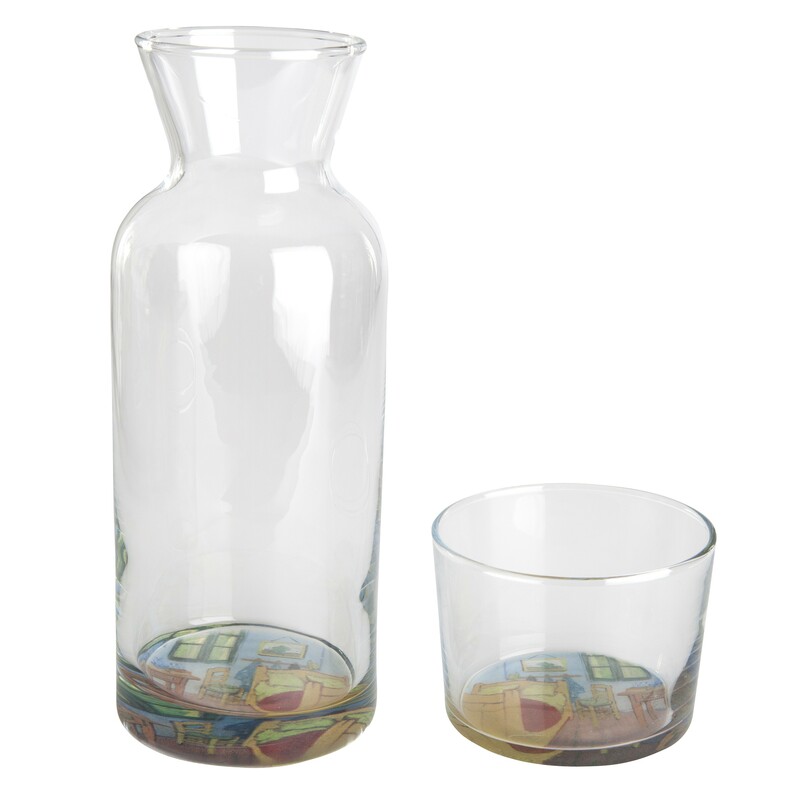 Charming and useful on a nightstand in the bedroom or guest room. 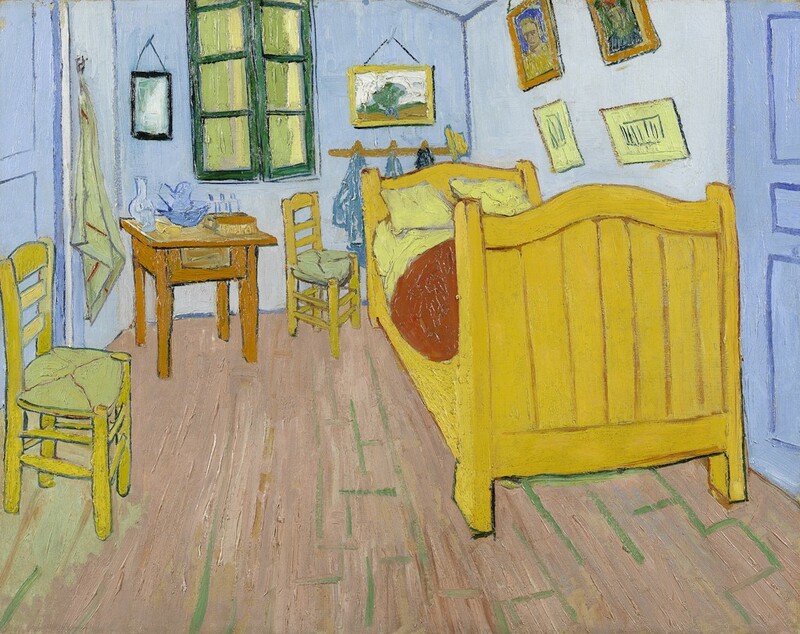 In this work, Van Gogh depicted his bedroom of his "Yellow House" in Arles, which he decorated with simple pine furniture and his own paintings. The back wall of the room seems to be tilting. This was not a mistake by Van Gogh. This wall was indeed not perpendicular to the others. However, he did not always strictly apply the laws of perspective. To his brother Theo, he wrote that he had painted the interior deliberately 'flat' and had left out all shadows to make it look like Japanese prints. One of the last paintings by Vincent van Gogh (1853-1890), painted while he was living in Auvers-sur-Oise, France. An oil painting from a series of landscapes on exceptionally sized canvasses 100 x 50 cm. Van Gogh was born in the Netherlands and later lived in Paris and other places in France. He did not have such a happy life and people in his lifetime disliked his beautiful paintings. In all his life, he managed to sell only one of his paintings. He earned no money and remained forever dependent on his parents and brother Theo. He takes to drink and is eventually admitted to a psychiatric hospital. He then decided to fully concentrate on painting. On July 29, 1890, Vincent van Gogh dies, leaving behind more than 850 paintings.